High resolution 3D laser scanning is a well proven and accepted technology in the plant design industry today, offering the plant designer a unique opportunity to have detailed and accurate "as-built" 3D dimensional knowledge of the entire plant before the design phase is started. In the past, the plant designer relied on out-dated drawings and information that was possibly inaccurate, as well as a limited number of field measurements which were obtained with a standard metal tape. 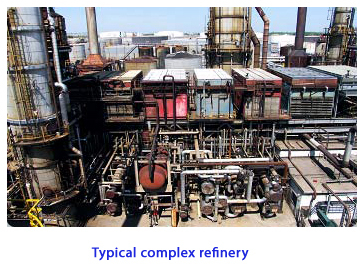 Critical plant design areas are typically found in difficult access areas (i.e. elevated pipe racks and towers). This often leads to unsafe and time-consuming field measurement practices. In addition, the plants are often located at significant distances away from the plant designer's office, requiring significant travel and unnecessary travel expenses every time they need to revisit the plant. This results in work inefficiencies and costly mistakes, which can have dramatic effects on the project timescale and therefore profitability. 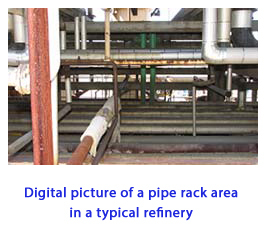 A simple mistake, such as misrouting a pipe through an existing plant, can have severe financial repercussions on the fabrication, delivery, installation, redesign and modifications required on site. With high-resolution 3D laser scanning, detailed 3D measurements can easily be obtained with just a click of the mouse safely, quickly and without revisiting the plant site. 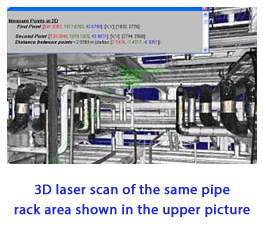 Compare the upper digital picture of a difficult access pipe rack with the 3D laser scan that was obtained from the same area.